Hi everyone! Thanks for stopping by today. I’m honored and excited to be taking part in another fabulous tour of homes coordinated by Marty from A Stroll Thru Life. She’s a talented, kind blogger that I am happy to call a friend. If you’re here from Decor to Adore, welcome! Laura’s blog is so beautiful- I am so excited she’s planning on heading to Ireland in 2017. I am smitten with her Eiffel Tower covered with flowers. It’s now on my to do list. Recently I was contacted to take on a huge DIY project in my home (details coming soon!! ), so both my living room and dining room have been in disarray for about 10 days, BUT I still wanted to show you all some pretty home decor to get you in the spring mood. 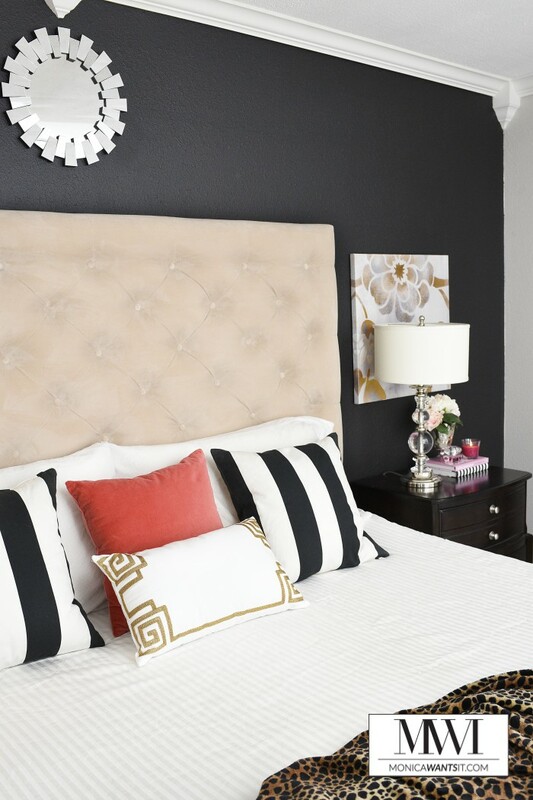 The main attraction today is the unveiling of my new black accent wall in the master bedroom. I am SO EXCITED to unveil my new master bedroom accent wall. I had blogged about wanting a black wall in my master bedroom back in July, and I took the plunge about three weeks ago. Looking back, I wish I’d done it sooner. The tricorn black color (from Sherwin-Williams) makes my room feel so luxe and cozy. Oddly enough, our master bedroom feels larger and brighter now. 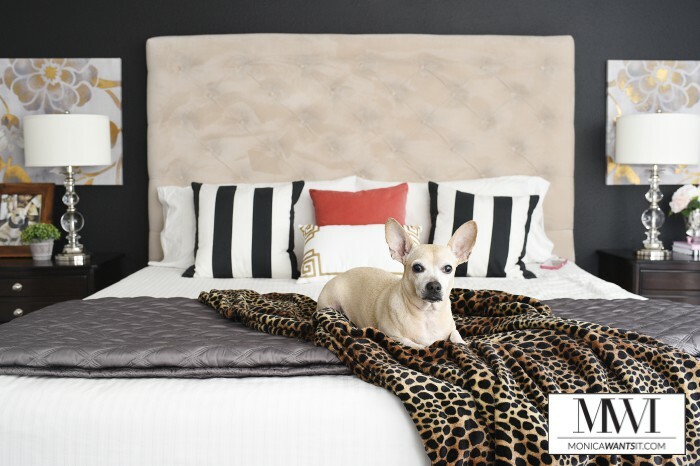 There are a few more things I’ve done to our master bedroom that I cannot share until April 5, so make sure to come back or subscribe (in the sidebar or bottom of this post) so you can see the full scope of the makeover. It’s swoon worthy. Let’s mosey on over to the kitchen. I’ve been undergoing a kitchen renovation since August, and although it’s moving at a snail’s pace, I have gotten the breakfast nook completed. You can read all about it here (and here), but here’s a few shots of the space in it’s bright, chic spring glory. The living room is the area that is currently undergoing a mini-reno, but I have accomplished a few things this year to revamp the space a bit. First is getting a new rug, painting my lampshades black and gold, redoing my bookcase, and getting a gorgeous new end table that cost under $150. I hope you enjoyed my spring tour! As you can see, I am loving coral, pink, orange and my signature black and white color palette. If you love a good before and after post, I’ll have a lot of DIY reveals in April. Now I’m turning you over to Barbara at 21 Rosemary Lane– her shabby chic, farmhouse style makes me want to book a weekend at a B&B, stat. So dreamy and romantic…love it. Oh my word, your home is absolutely stunning! I love the colors and the details and it's just all so gorgeous! I love this new dark grey/black accent in the bedroom. I personally choose light colors for home, but enjoy staying in hotel rooms with dark or bright accents. Your home is beautiful. You did a great job with all your decorating. I always wonder about a "dark" wall, if it would make the room look small. Very bold and very beautiful. Beautiful, beautiful, beautiful! Did you paint over wood paneling in your house? I want to do that SO BADLY, my living room is from the 80s and very dark because of that damn paneling. The black wall is amazing. It really makes all the little touches of color pop. WOW what a nice job and there is so much to look at! I love the use of the stripes and how the darks work so well within the spaces. I am shocked how well the black wall looks! My home needs a major redo. Thank you for all the inspiration! This is perfection love it all !! Especially the pops of color on the shelves ! Your bed room give me some inspiration to redecor mine. I've been looking for some inspiration for my bedroom, now I see this decor, I'll for sure make some changes. Your home is so comfort and lovely. I love all of the black and white! That gorgeous lamp on your bedside table is my absolute favorite! Your home is oh, SO gorgeous! All the black and gold touches make it so luxurious. Love it! You did an amazing job all over your house. I love the make over on your beadroom. I love your sitting area too. You have a beautiful house. What a stunning house. 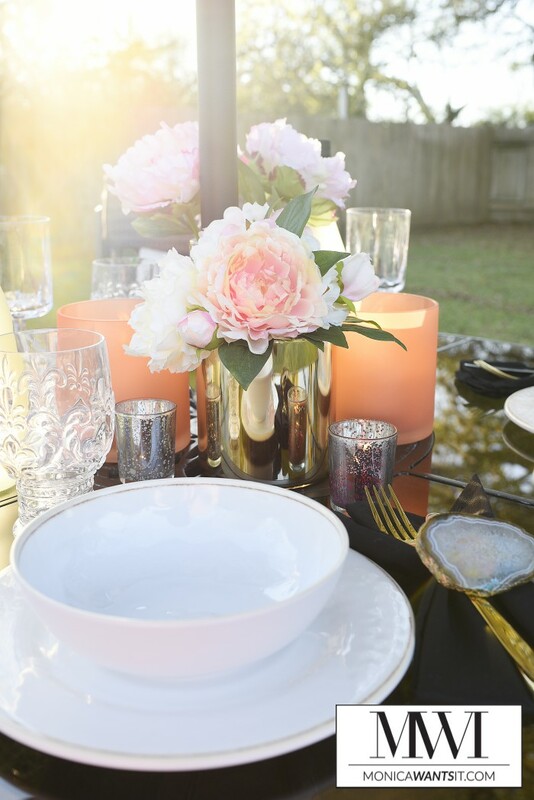 I love the lamps and the peonies scattered throughout. 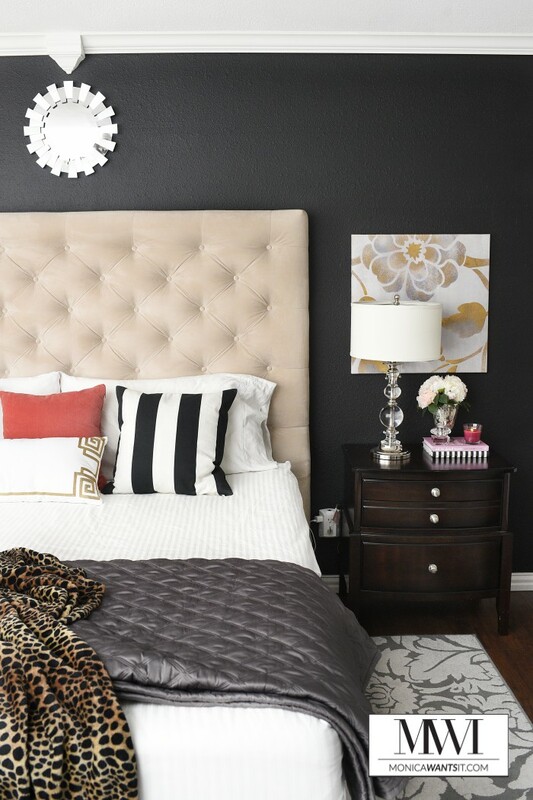 I didn't think a black wall would make a room look brighter but your master bedroom is stunning and peaceful. Beautiful. This reminds me that I should probably do some cleaning today… lol. Your home is absolutely beautiful. 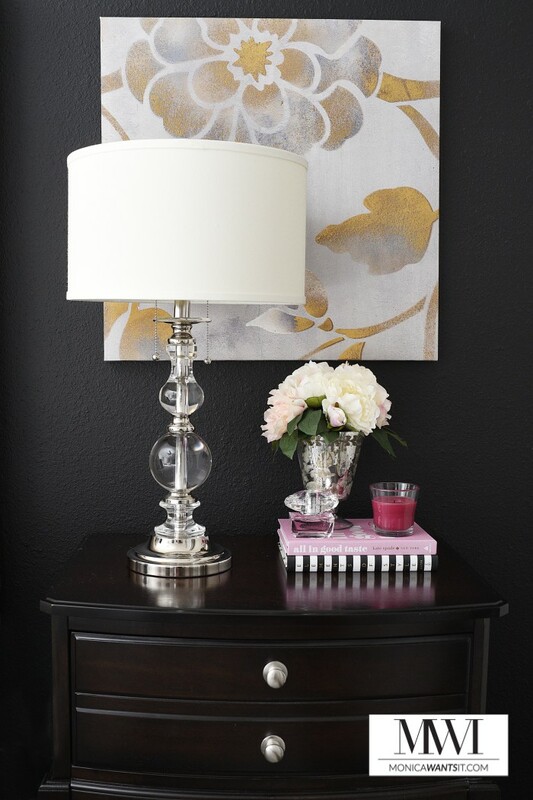 I would have never thought about putting art behind the lamps but I love that look! 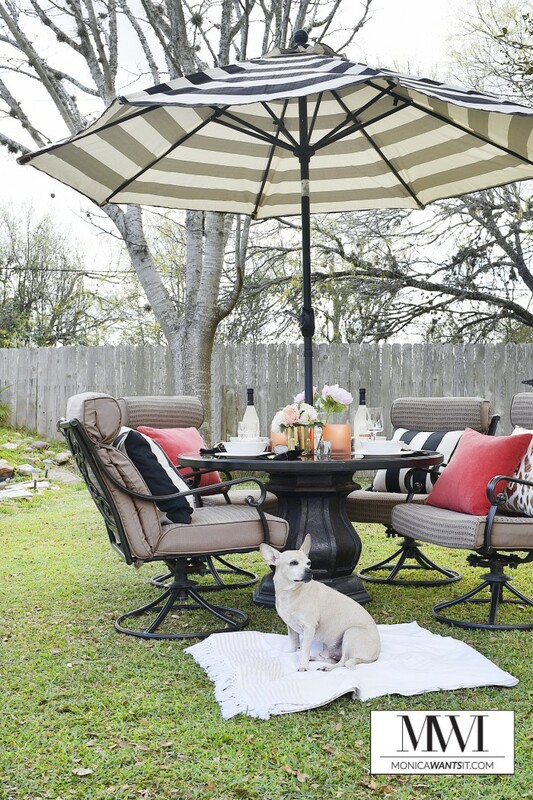 I absolutely love your decor and the dog makes the perfect accompaniment to photos. I love the glass lamp with the ornamental balls. You did an amazing job in your bedroom. My room currently has black furniture and I added black lamps with white shades to give it a little pop but I love the way you did yours. I'm inspired now to do a mini makeover. oh my gosh, the lamp in the first few pics…. the glass one with the ornamental balls…. LOVE LOVE LOVE! Everything looks lovely! Such a beautiful home. I love those gold end tables; I have been looking for some for quite some time. Wow, what a beautiful home. I love how it is decorated! I'm so jealous she gets to go to Ireland! She does a fabulous job! Good luck to her and her adventures! Your home is absolutely GORGEOUS! I love the black wall in your bedroom. Your house is gorgeous! Love the lamps you have in your master. I have been looking for new lamps for our bedroom and those would be perfect. Magnificent! And the black wall is super glamorous. .I can't wait to see the rest. . Your home has spring fresh all over it. It's all so stunning, Monica! It's glam but none of it is too girly, and it's so sophisticated. Come help me and my house! Ha. Oh Monica, I love your black wall in the bedroom. It is so pretty. I can't wait to see the rest of the makeover. I adore your breakfast area, it has come together so beautifully and of course I love the pretty black and white with touches of color and your signature gold accents. Thanks tons for joining the tour. Monica I cannot get over how fantastic that black wall looks! It can be a challenge to pull off and you did it beautifully. Have an enchanting Easter. LOVE the changes to your bedroom and your new little kitchen nook – such a great space! Your whole home is so stunning!